The forest garden at The Sustainability Centre was originally created by volunteers in 1999. It followed a design by Patrick Whitefield, the eminent permaculture author and forest-gardening guru. The underlying concept of forest-gardening is to mimic the ecosystem of natural woodland to create a highly productive landscape for human use. Instead of bare soil planted with neat rows of annual veg and vast orchards of a single fruit species, the forest-gardener aims to plant a diverse tapestry of edible and useful plants. Beneficial relationships between plants, site and soil are developed to create a garden where ground-hugging perennial vegetables grow amongst herbs and soft fruit bushes, which in turn are sheltered under the canopy of trees yielding nuts and fruits. Forest gardens can be created on any scale, and with careful planning should be a very low-maintenance way of growing food whilst also creating a beautiful wildlife-rich environment. The use of mulches and careful selection of species mean that the garden can largely be left to its own devices. As Patrick says, "The main task is picking the produce!" 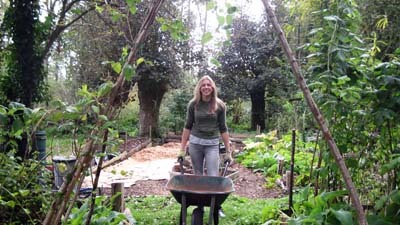 Forest gardening follows many of the principles of Permaculture. The word Permaculture originated in the 1970s from the writings of Bill Mollison, and was originally a fusion of the words "permanent" and "agriculture" (or possibly "culture"). Permaculture design relies on a process of careful observation and planning to seek out beneficial relationships between all parts that make up a system, whether that be a farm, garden, home or community. The basis of Permaculture is to provide thoughtful, environmentally sound solutions and creative use of resources, following the ethics of: "Earth care, People care, Fair shares". Here at The Sustainability Centre we use Permaculture as a major inspiration in the design of our numerous activities. We are lucky enough to share our site with Permaculture Magazine producers Permanent Publications who also publish many books on the topic of sustainable living. Our forest garden flanks the pathway leading up to our visitor reception. Much of the original planting has flourished, and current harvests include apples, cherries, rosehips, gojiberries, currants and gooseberries. We are currently engaged in identifying and recording all of the original and existing species in order to label the plants and highlight their uses to our visitors. Our next step is to prepare some areas for re-stocking which will include mulching the grassed areas and removing some unwanted invasive species. In addition to work in our forest garden, volunteers are continually engaged in the upkeep of our herb and wildlife gardens as well as planting up our camping area with numerous fruit trees, including figs, walnuts and olives. We aim to inspire visitors with an attractive landscape abundant in useful and edible plants. We believe that a forest garden system can yield a far greater harvest than conventional monoculture growing systems - and that integrating living, working and growing spaces is vital to a healthy human environment.